For a UN Volunteer accumulating data on people's integration for UNDP's Disarmament, Demobilization and Reintegration program in South Sudan, success stories are the best part of the job. Wau, South Sudan: Everybody likes a story with a happy ending. This is especially true for people working on the disarmament, demobilization and reintegration (DDR) of ex-combatants and women associated with armed forces and groups (WAAF). As a Management Systems Officer, Prince Isaiah, a UN Volunteer from Liberia, accumulates data on peoples reintegration for the Crisis Prevention Recovery Unit of UNDPs DDR program in South Sudan. For him, finding success stories is one of the best parts of his job. The database also monitors and evaluates the different livelihood options they followed after their reintegration into society. He finds very gratifying stories like that of Aisha Yahiya, an ex-combatant who returned to Wau after her demobilization in Juba in 2009. Aisha is the mother of nine children, Prince reports. After the loss of her husband, Aisha, the mother of nine, joined the Sudan Peoples Liberation Army in 2004 and was deployed to serve in Kubri Arbein, one of the military camps in Juba County. After the CPA was signed, she was deployed to Mangala where she entered the DDR program. Once demobilized, Aisha returned to her own state of Western Bahar El Ghazal and during her reintegration counseling chose to train in running a small business. Training in small business management, literacy, numeracy and civilian skills development followed as did her certificate. In January 2011, with her training done, Aisha received a small business reintegration assistance start-up kit through the International Organization for Migration (IOM). She started her business by selling a few basic items such as charcoal, peanut butter, soap, sugar, salt, tea and candles at her kiosk. Her business has expanded steadily to the extent that she can make a weekly profit, Prince is happy to report. 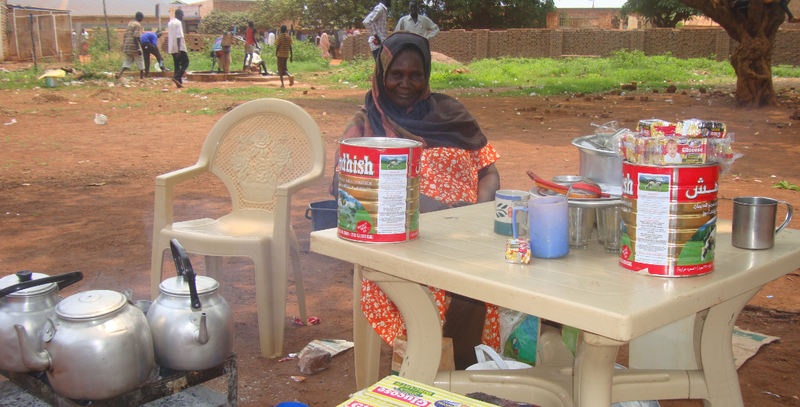 Aisha has also undertaken a profitable sideline in preparing and selling tea and biscuits to ex-combatants attending nearby reintegration training which is paid by the implementing partner (IOM). She now divides her time equally between selling tea in the morning and attending her small kiosk in the evening. Aisha said her only challenge is that she does not have a plot of land to build her house on. Currently she lives with her mother. She is hoping that as an ex-combatant, the SSDDR Commission will support her by providing her land for her house. Despite this challenge, Prince reports that Aisha is planning to build a small shop to sell her goods. She told me she is sure she has the money for this and already has 12 pieces of iron sheet metal set aside for her building, said the UN Volunteer. Come what may, Prince is pretty sure a happy ending is on the horizon for Aisha.